Have you ever had dinner in a pumpkin? It literally is just that (...unless you're thinking it's all of us sitting down to eat a meal in a giant pumpkin, then you're wrong. And I'm bummed, cause that would be so great). But really, it's a meal baked in and served from a pumpkin! The first time I experienced this fall dinner delight was while I was in Idaho at college. My friend, Jill, invited a bunch of us over for a fancy fall feast. It was amazing. And I was so impressed that our dinner was being served from a pumpkin. Does it get more fall than that? I decided to cook this fun dish for dinner last night because my parents were coming over to eat with us. The recipe makes a lot, so I wanted to make it when I knew we would be having guests. It was a hit! There are lots of recipes dishes you can make in a pumpkin, but this is the one I chose (and loved. Seriously, I think I had thirds at dinner. And I went back later and snuck some for dessert). 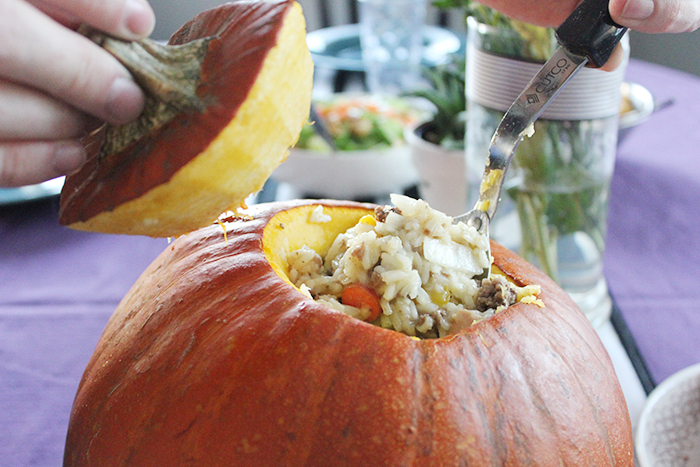 tip: when serving, scrape the inside of the pumpkin a little whenever you're scooping out a serving. The pumpkin is baked and tastes awesome with the rest of the stew stuff. **I saved some of the seeds and roasted them and then used them on top of the salad we served with dinner. Here's an easy recipe for roasted pumpkin seeds. And for our salad, I used the Trader Joe's cilantro dressing and it was soooo good! It is a total dupe for the cilantro dressing at Costa Vida, and tasted awesome with this meal. For dessert, try this recipe for chewy pumpkin chocolate chip cookies! This is amazing!! I'm going to try it this week. Thanks for the post!